The Proton X70 has been awarded the full five star rating by ASEAN NCAP in the latest crash safety test. What’s more impressive is that the C-segment SUV – a MY2018 Executive example – sits near the top of its segment for occupant safety. Proton credits this achievement to its Hot Press Forming (HPF) technology for body structures, which provides a high level of protection for passengers. The combination of six airbags (standard for all variants), Isofix child mounts and seat belts with pretensioners and load limiters help the X70 achieve a perfect score for the side impact and head protection tests. Also, the X70 was tested based on the latest 2017-2020 testing protocol, which takes into account the vehicle’s safety assist technology and carries a scoring weightage of 25%. 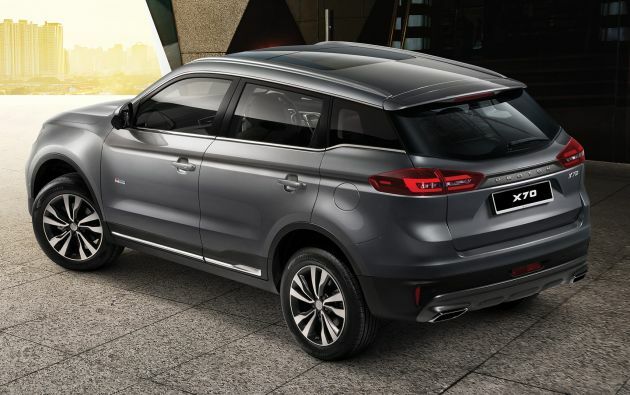 As you would know by now, the Geely Boyue-based SUV is the first Proton model to be offered with autonomous emergency braking (AEB), forward collision warning, lane departure warning and blind spot information system. Click here for the full list of specs of the X70. To compare, the X70 scored a total of 35.27 points in the adult occupant protection, ahead of the 2017 Honda CR-V 2.4 (34.02) and 2018 Toyota Rush (31.14). 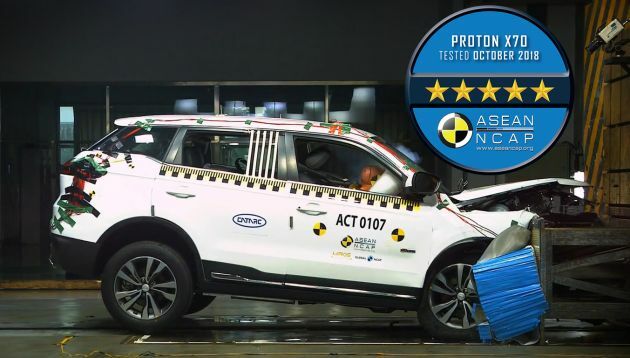 Both the X70 and CR-V scored the full 16 points for side impact protection, but the Proton fared better than the Honda in the frontal impact (15.27 points vs 14.76) and head protection (4.00 vs 3.26) tests. You may find the full crash test report of the X70 below. Conversely, among the three, the X70 scored the lowest in the overall child occupant protection, with a score of 40.78. The 2018 Toyota Rush scored 41.81, and the CR-V was awarded a score of 44.76. Proton Edar’s CEO, Abdul Rashid Musa said: “Thanks to the diligent effort of Proton’s designers and engineers, the company has managed to extend its reputation for building cars capable of protecting their occupants in the event of an accident.” Other Proton models to be awarded five stars by ASEAN NCAP are the Iriz, Persona, Preve and Suprima S.
“Aside from the advanced driver assistance system that is making its debut on a Proton model, the Proton X70 is also fitted with various convenience features such as voice command, adaptive cruise control, intelligent high beam control and a 360 camera for safe manoeuvring in tight spaces,” he added. Moving on, the X70 will be making its first ever public debut at the upcoming Kuala Lumpur International Motor Show (KLIMS 2018), which is set to kick off next week from November 23 to December 2. Five units of the SUV will be displayed at Proton’s booth (Level 1, Hall 1), so be sure to go up close and personal with Proton’s latest and greatest. “Proton is now ready for our SUV to meet the Malaysian public, Visitors to KLIMS will be given full access to our show cars and we encourage everyone to explore the various design, technology, safety and performance aspects of the Proton X70 by spending some time at our interactive areas to get to know it better,” Abdul Rashid said. Syabass & gudluck Proton! X70 price ? Why tested on a LHD, how is it a Proton ? Why LDH? Have u seen the video? I hope Proton dont kelentong ANCAP again. Already got caught with pants down before, I hope they are honest this time. Preve also 5 star but when light accident, car hangus become scrap metal. Syabas China. You give Malaysians so many safety features and so many airbags. Even our own Proton for 30 years never gave us this kind of safety features before. This car sure to do well. Thanks to the brains of Li Chunrong. Li Chunrong, in 6 months, have turned Proton around for the better. Our local CEOs could not turn around Proton the past 20 years. I am confident the Proton X70 will sell very well. Thank you China for saving Proton. We are grateful to you. Dah sesat kau ni. This is article about P1 X70 lah. The Corolla one is after this. LOL copy paste fail big time! I better buy the new Toyota Vios. At least I go kenduri, I can park my car right infront of the kenduri house. If I use X70, I got to park my car far far away from the kenduri house. Driving a Vios and park right infront of the kenduri house will make one look like an idiot. Porsche Cayenne maybe ok.
wow, the world’s best selling car has got even better. This car comes to Malaysia will sell like hot cakes. No wonder our regular Proton bashers here, John Minum Teh 8X are hiding today. Pity China had to save Proton. Proton have come out with 5 star cars like Preve and Iriz but both also have failed badly. Nobody said that but u lor. Dun shiok sendri, u lost badly time and time again. End of story line for SUV under Japan in M’sia. X70 is safer. Still not sure quality and reliability yet. Lets see new user of X70 drive for 3 months first and we will decide. New stuff always imperfect. No matter which brand. But Malaysian used other method able to know the reliability of the new car. And still no price. Makes you wonder if they are unsure about the pricing strategy. I for one won’t pay more than RM120k for the top spec. Reading the reviews and blogs, the car seems very competent. Let’s hope! Tipu Miti … So price frozen by Govt. P1, the benchmark in safer cars. Kudos! U mean like the time Biza fail ASEANNCAP test and P2 needed to scramble 1 “approved” car for a retest? Interesting they mention ASAT is standard or optional. Meaning for lower specs, can still addon ASAT? Wow, P1 X70 can be an even safer car than it comes standard equipped. Advanced Safety Assist Technologies. ie all those advanced safety system in luxury cars. No meaning theres possibility for lower specs can still addon ASAT when booking the car. It be factory fitted like top specs. Impresive results there. It could be the best selling SUV in Malaysia if priced correctly, but the fanboys here are making the X70 look like a demonic spawn from the depths of hell coming to destroy other car brands. No hate but what are the desginers done for this CBU model? I hope this would look more diffrent for the CKD version. Yup. Haters gonna hate. But destiny still arrives. This UV will be the hottest thing in 2018. Yeah, me too! At least the ride and handling. Hopefully the transmission tweak too but only if the DSI trans is available for tweak. Just to slightly reduce the 0 to 100 sprint. When launch and what official price ??? Seems too long sneak preview, people are losing mood already lah!!! Redeveloping a car that was purely designed as a LHD into RHD is more than just a simple rebadging or a lazy conversion like them Frenchies. P1 engineers had a lot of input into X70 as PT articles can be a testament to that fact. Huge congrats to Proton on their ASEAN NCAP rating ! Many would have already expected the X70 to score the full five stars, but few would have expected it to score higher marks than the latest CR-V, which is a global model no less ! This reminds me of the 2012 Prevé’s higher-than-expected ANCAP score, which was higher than many of its comparable competitors including the 2011 Focus, 2011 Elantra and 2012 Sylphy. Even though the HPF technology, airbags, ABS and ESC modules are all foreign technologies ( Proton didn’t invent them, they only license produce them, like most smaller car companies ), over the past few years Proton has helped make these safety tech accessible to the rakyat. Proton made ‘ affordable safety ‘ their new USP, which meshed perfectly with their old ‘ Lotus Ride & Handling ‘ USP. Things should only get better for Proton moving forward. Volvo has vast experience in safety tech, and their cars always get the highest scores in crash tests. Geely has the vast economies of scale to mass produce high-tech safety gear and make them more affordable and profitable, faster. Proton meanwhile really knows how to make a car handle well without overly compromising ride comfort. Supposedly, the Suprima S chassis was tuned by Proton engineers without help from Lotus. In fact, Mitsubishi themselves were impressed by how well the Inspira handled compared to the Lancer it was based on ! Mesh these 3 together, and you should get a car which is really safe, value for money, and rides and handles well. Looking forward to the launch of the X70. On paper, and from the media reviews, I believe it’s safe to say that the X70 is a great car whichever way you look at it. From Proton’s perspective, product wise, it might be comparable to that time when the Saga LMST was replaced by the Saga BLM… suddenly, Proton had a vastly superior and up-to-date product compared to the ageing Proton cars people were used to. The X70 will be a quantum leap for Proton. The only thing which still worries me is the pricing. We’ll see how it goes. Ive told u. Hpf steel is the best. Hidop proton! So does this mean Proton used it’s own manufacturing tech for the body structure? is this car still importing? when will the local manufacturing or assembling starts? Tak gunanya dpt 10 bintang pun sbb bukan buatan malaysia…SUV ini china punya hanya proton copy ja…nk bangga apa dgn benda copy. You mean p2 since day 1? Until now only brouhaha about the model…. Almost end of 2018 and Proton still playing guessing game with malaysia….. And even talked about game changer……. Just close shop if you still want to delay the launching…..
arghhh so nice! so what’s the price haha. No side curtains? Stripped off as usual to meet lower ASEAN NCAP standard. While China owners enjoy the EU standard at lower prices. This tested car has 6airbags. Read b4 bash lor adoi! Say no to China. When the buying stops, the selling will. I salute proton can produce their own capability to introduce x70 to Malaysian. 100% Malaysian made.. kudos! Where is Proton GDi & TGDi engine project? Heard the base model price starts from RM118,688 hmmmm I think the HRV is a much better car and value than the X70. Although X70 its a 1.8T, but its still slower than the HRV, Vios or even Honda City. And the FC of the X70 is like an old 3.0L petrol v6 engine 20 years ago. Next Post: Subaru XV bakal terima teknologi plug-in hybrid – dengan jarak elektrik sepenuhnya sejauh 41 km?